Another savory recipe for a Barefoot Blogger challenge! Love it! This, the 5th BB recipe, was chosen by Ashley of The Spicy Skillet and I have to say she did a great job with her pick! I know choosing a “different” type of recipe isn’t easy…wondering how people will react to it…hoping that everyone will put their finickiness aside and try the dish…and to be honest, I was nervous about the outcome…not that I ever considered not making it. 😉 However, when breaking down the recipe, I realized that I loved all of the ingredients with the exception of maybe the dill but I know enough about Ina’s recipes to trust her. She knows what she’s doing. And since I really didn’t know how the Smoked Salmon Spread would go over with Kyle (along with the fact that all of Ina’s recipes seem to feed an army), I decided to put this on the menu the weekend my mom was here to visit recently. This weekend was decidedly about trying out new recipes, including the Coeur a la Crème that I’ll be posting about on July 31st, so I ended up making all three of the BB’s July recipes (including the Bonus recipe) plus an extra Contessa recipe in one weekend. Needless to say, we ate well. The salmon spread came together in a breeze. I added some extra lemon juice and horseradish (which didn’t need to be drained) and had to use dried dill because I forgot to buy fresh. 🙁 No biggie, but I think fresh would have definitely added an extra level of flavor. As for the salmon, I know that Ina recommends Norwegian salmon but I wonder if that tends to be more of a delicacy found in gourmet food stores (correct me if I’m wrong! ), so I went with smoked wild Alaskan salmon that I found on sale in my grocery store’s seafood market for $4.99 (4oz.) I was thrilled! I served the spread with sliced up cucumbers and bagel chips and it was a big hit! I made the full recipe so it was way too much for the 3 of us but we all definitely enjoyed it and I will definitely make it again…perhaps for the 30th (shhh!!) birthday party Kyle is planning for me next month for which I’m not supposed to be making/cooking/baking anything. ha. Thanks again to Ashley for a great pick and for continuing the fantastic streak of Ina recipes we’ve had so far! You can see how the rest of the group did with the salmon spread here. August’s recipes will be post on the Barefoot Bloggers blog on July 31st so be sure to check back next week too! Cream the cheese in an electric mixer fitted with a paddle attachment until just smooth. Add the sour cream, lemon juice, dill, horseradish, salt, and pepper, and mix. Add the smoked salmon and mix well. 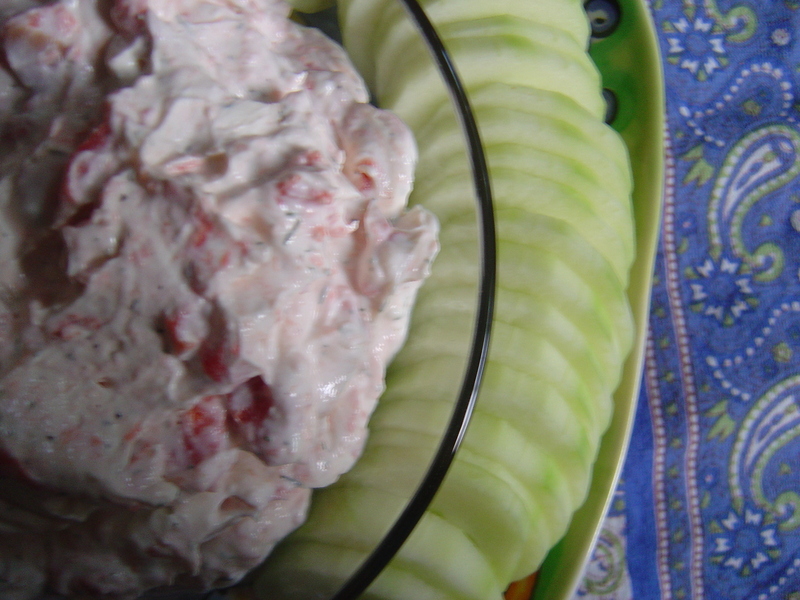 Chill and serve with crudites or crackers.If you can find it, I prefer Norwegian salmon; it’s drier and less salty than other smoked salmon. 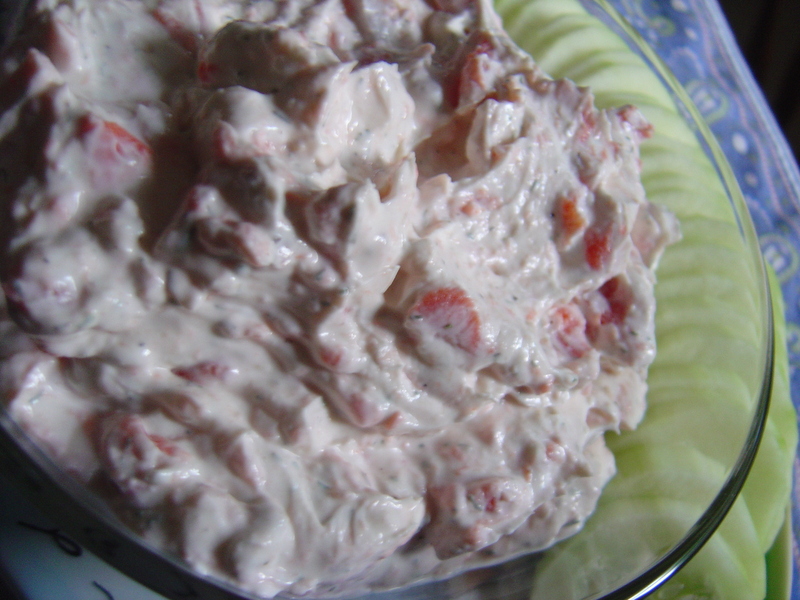 I’m a snacker and love dips, so this is going to be filed in my “must try” list of recipes. Looks great! Great match with the cucumbers. Glad you enjoyed it. The cucumbers were a great idea, and your photos are beautiful! Looks gorgeous…glad you liked it! $4.99 for 4 oz. of wild Alaskan salmon…I paid $6.99! I’m jealous! Your pictures are amazing. Did you buy the special dish for the creme, or did you use something else? Cat’s – nope – i used my mesh strainer. I have made this before and it the “peoples” love it!! By the end of the night the bowl is empty – Another great thing to serve it with is bagel chips..
Ooooh, I love the cucumber “chips”! Very clever. Great job. It sounds like you were rocking quite the Barefoot Contessa feast. Just wanted to let you know you’ve been tagged! Great pictures–glad you enjoyed it. Mine wasn’t so great–bad salmon choice, but I have made it before and know how good it is! 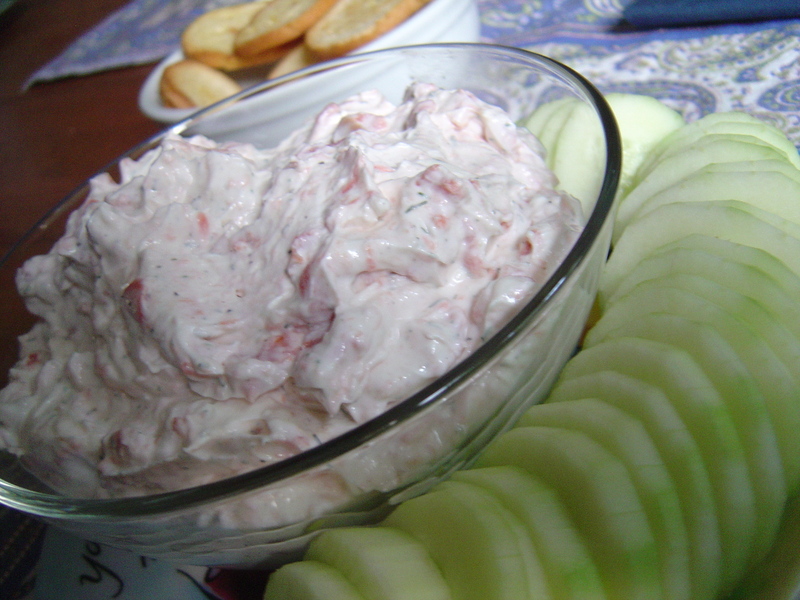 The smoked salmon spread looks delicous! Great photos. Oh yea, I have baked/cooked for so many of my birthday surprises!! It was always fun! Looks great! This was a hit with me as well. Very tasty! Your blog is fantastic. I am so happy to have found it. And this dip looks delicious. I look forward to giving it a try.